I have just spent three days riding motorcycles in some of the most inclement weather that it’s possible to throw at a biker. I did this because Deeley Harley-Davidson Canada invited me and a few others to talk about our businesses, learn about the brand, and experience (for the first time) their motorcycles. I wrote earlier about my snobbery in Motorcycling, and how it’s kept me very much on the SportBike path since I started riding. Since that post I’ve had a few hundred KMs of rain-soaked riding to reflect on what it all means. But in the end rain-soaked boots won’t be the crux of what I take away from the experience. When I was invited I was asked to choose the sort of bikes I would ride. Being a SportBike guy who rides a Triumph Daytona 675, I chose the bikes that most closely reflected my present daily riding experience. That’s pretty hard in the Harley line, but I trended toward their sportier bikes like the Night Rod and the new XR1200X. That was a mistake, I think. What I, as an outsider, needed to do was to dive in head-first and immerse myself in the brand, in the identity of the bikes, and in the feel of a true Harley-Davidson. Fortunately they did hook me up with the Fat Bob, a fairly quintessential Harley. It’s not the most attractive motorcycle in the world, however it is a brilliant entry point to the Harley lineup and delivers a very smooth and comfortable ride, as documented in my earlier post — and it is superbly nimble and fun. 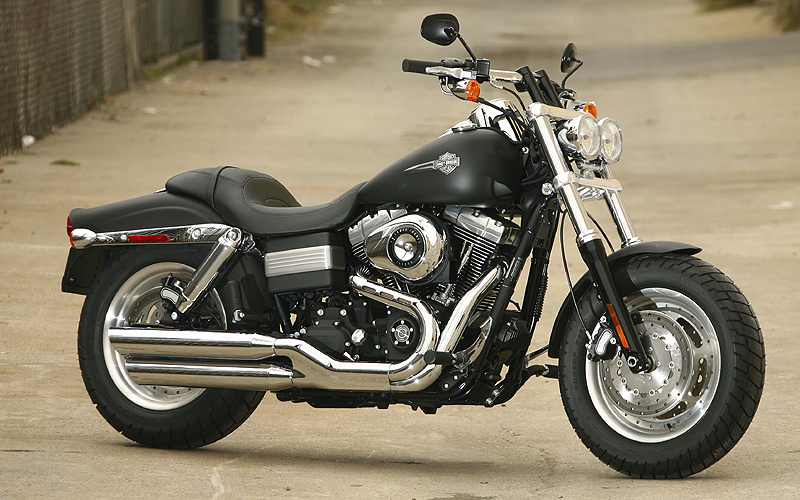 It really is the heritage of Harley as an eternal maker of motorcycles that is the crux of its appeal. This thoroughly staid, fire-and-iron, high throttle-to-decibel-level ratio, sprung-seat comfort image is one that the market understands about Harley and should more enthusiastically be embraced by the company and riders alike. It is not the common ambition of every young would-be motorcyclist to own a Harley in the same way that it hits you in your late-40s. This is a problem for Harley. Kids (including this perpetual kid) dream of slick street bikes and crotch rockets, going fast, and leaning hard into corners. “Chicken strips” is not a term commonly thrown around by cruiser riders in the way that it is in SportBike circles. But there are a few gaps between the dream and reality. The vagaries of riding sport- and streetbikes are one of the things that compel you by comparison when you experience a Harley. Riding a Harley is a unique experience. There’s something absolute about that V-Twin banging away between your knees and that low roar at idle, coupled with the welling storm that emerges from the tailpipe when you twist the throttle. Gritting your teeth and growling through big highway corners or windy parkways often makes you feel like there are probably chunks of asphalt being dug up as you grind along. From a practical perspective, for me as a sportbiker riding a big comfy cruiser makes the sweat and toil, back pain, cramped muscles, frequent gas stops, and lack of stowage of riding a SportBike start to look more than a little impractical. So for a guy like me, who likes to do long multi-day rides and 7-hour days on the road, the prospect of cruising on an old-school Harley lifts an eyebrow or two. They don’t require constant management at the same level of intensity as a sportbike, and you really can look around at the landscape on each side of the road. I think that Deeley seems to do it best in propagating the experience in Canada in numerous interesting ways. Outreach programs like the one I just participated in are particularly impactful. The brand’s heritage, too, has appeal. One of the elements of the motorcycling experience that really makes a difference is the spirit of community and camaraderie. You’ve seen an aspect of it when you’ve observed bikers passing in opposite directions waving or nodding at one another. 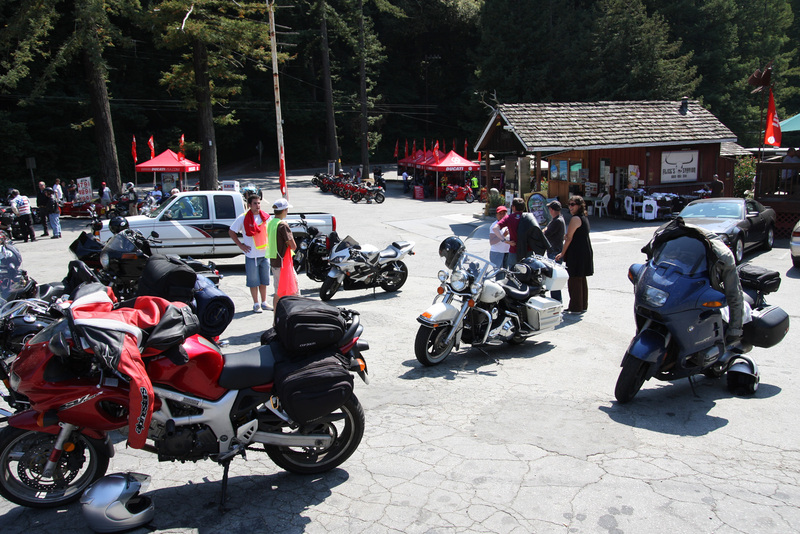 You’ve seen another when bikers of all stripes gather at locations like Alice’s on Skyline Boulevard in California’s Santa Cruz mountains. Group rides are very common and one of the ways in which they converge is around brand association. Thanks to movies like Easy Rider and books like Hell’s Angels, the romanticism and rebelliousness of the Harley appeal to many people, like me, who seek out authentic experiences. You simply can’t have an authentic road trip Easy Rider-style on a Honda. And the brand’s unbreakable bond with motorcycle gangs like the Hell’s Angels, which has been reinflated as the backbone of the Sons of Anarchy series, certainly reinforces the image of rebelliousness that many folks buy into. As the anachronism of the Hell’s Angels and their criminal image fades, the heritage of the motorcycle they choose (exclusively) to ride remains. And as with all motorcycles, we associate adventure with our rides whether it’s the near-miss on the freeway, the summer rides through the redwoods, or the wild tales from group rides past. No other form of personal transportation is afforded this much mystique and intrigue. Will a Harley-Davidson be the first set of wheels bought by 21-year-old kids? Maybe not.. but H-D’s bikes aren’t priced that way anyway. Like a fine Bordeaux (or maybe an ice wine) a Harley is a sign of sophistication, elegance, and refinement. Something you grow into. Something you evolve to owning. A fraternity (within the brotherhood of all bikers) into which you can, with time and effort, be initiated. It certainly does, and after this weekend riding with Don, Malcolm, Pat, Buzz, John, and the others I already have a few stories to build on.